By Alexis Leon & Gibu Thomas, Comdex Computer Publishing, 1997. The objective of the book is to familiarize a person in the IBM Mainframe environment and give a comprehensive coverage of the most popular IBM products/languages like VS COBOL II, JCL, VSAM, CICS, DB2, etc. The book covers in detail the IBM Basics like the MVS environment, storage and data management, system initialization, job management, managing work, I/O processing, etc. The book gives a thorough and comprehensive treatment to topics like JCL, VSAM, CICS, DB2, etc. An overview to IMS is also provided. An entire section is devoted to Software Engineering and Structured Systems Analysis and Design (SSAD), which covers all the aspects of the Software Development Life Cycle (SDLC) and other topics like Configuration Management, Software Testing, Technical Documentation, etc. The book covers VS COBOL II and the various operations involved in creating and executing a COBOL program in the Mainframe environment. The compiler, link-editor and run-time options are discussed and the techniques for improving programmer productivity are covered. The book assumes that the reader have a reasonably good knowledge of COBOL 85. 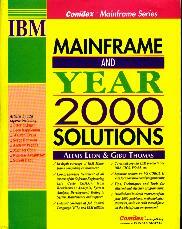 This book is written with an aim to give the reader an in-depth understanding of the IBM Mainframe, the mainframe concepts, the popular IBM products/languages, the Y2K problem and its solutions, without burdening you with the complex details you will never use or need. This book is unique as it is designed specifically to assist the experienced as well as the novices, the designers as well as the developers. In other words, it a single-point reference book for all mainframe professionals.